The concluding session of TecBridge’s 2015 Entrepreneurship Institute was held this past weekend on October 31st. In this third and final segment of the Institute, eight teams from various regional colleges and universities in addition to the newly invited high school students, “pitched” their business ideas to a panel of judges, consisting of business leaders from our region. The first two days of the program were conducted in Marywood University’s newly built Entrepreneurial Launch Pad. A total of sixty-seven students from various regional colleges and universities participated. Throughout the TecBridge program, students gained valuable insight on how to build a business plan, raise capital, and run a successful company. This year, Helen Barosky, Manager of Financial Services at Prudential, was appointed to chair the Institute committee. At Marywood University, students participated in various exercises and activities that helped them to develop their idea generation methods, led by Jeffery Babin, from the Wharton School of Business. The goal of one of the exercises was to help the students improve their techniques of group decision making. By the end of the activity, the participants of the Institute understood how working in groups can make for stronger, more stable business ideas. In addition to brainstorming and idea generation, the students heard from enthusiastic local entrepreneurs, such as Pat Sandone of Net Driven, Alex Brunelle, the first winner of TecBridge’s Annual Business Plan Competition, Mike Averto of Otreva & ChannelApe, and Maria Conigliaro Traino, the founder and owner of Inspired Design Studio. These speakers eloquently shared their own stories about what it’s like to start up a company and be successful in the world of business. When judging day arrived, eight teams were ready to conduct their presentations in front of a panel of judges, which included the expertise of Jerry Lisman of Lisman Holdings Inc., Frank Winger of Astronomical LLC, a 2015 Business Plan Competition Winner, Ted Brunelle of Nearbid.com, and Diana Scott Shields of Fresh Mind Coaching. The judging session was conducted at Wilkes University and hosted by the Allan P. Kirby Center for Free Enterprise and Entrepreneurship. Eight teams from various regional colleges and universities, in addition to the newly invited high school students, presented their business plans for cash prizes. Presentations included products that ranged from a revolutionary drone security system (controlled entirely by an app), to an antivirus software thumb drive, and even to a company planning on constructing luxury dog kennels. In addition, two high school students were the youngest participants of the Institute to present their business ideas alongside students from regional universities. The four judges heard from the eight teams, and selected the top three companies that they believed had a core focus on viability of concept, and had the potential of making an impact on the economy/local region. 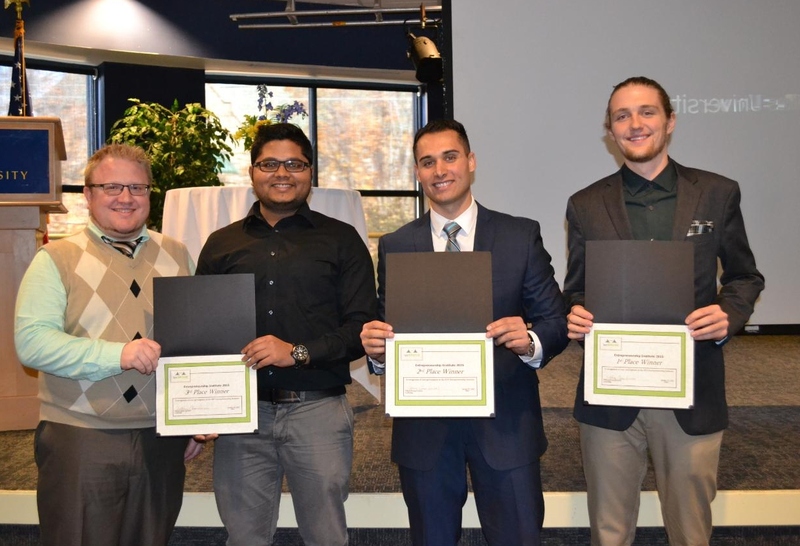 The team selected for third place was Fudory, composed of participants Dixit Patel, Tom Walte, Nick Frushon, of Penn State Wilkes-Barre. They pitched their idea of Fudory.com, a website allowing local foodies to post photographs of appetizing dishes. Second place was awarded to Fader Plugs, founded by Blaise Delfino, of East Stroudsburg University. Blaise is currently developing ear devices that will aim to protect users against hearing loss, while still providing customers with the best sound and custom design. The coveted first place award was given to Edward Powell from Wilkes University. Edward’s GearHead Garage is a meeting place where people can share their mechanical capabilities with others and join forces to fix cars. These three winners were awarded cash prizes for their viable business concepts and presentations. However, all participants of the Institute came out of the judging session with the knowledge of how to build a business plan, raise capital, and run a successful company. This year’s program was sponsored by Berkshire Hathaway Guard Insurance Companies, the Institute’s newest sponsor, and also by Predictable Property LLC, the company of entrepreneurs Ted and Alex Brunelle, who were the first winners of the Annual Business Plan Competition. Tiffany Cross Luciani discusses the importance of these gracious sponsors and says, “Both these sponsors allow TecBridge to continue facilitating the Institute’s world class learning experience to all 100+ attendees.” As a TecBridge feeder program, the Entrepreneurship Institute prepares 2015 participants for the upcoming Business Plan Competition of 2016, the signature event which will be held this Spring.